A #26 head is news to me. Might have been a typo or something. Last I've heard of is the infamous #22. Thanks for the responses. I'll probally begin pulling everything on Monday. I'll post pictures as I go, just in case I need some veteran help. I think if my head ever goes I will try to get a good used head. 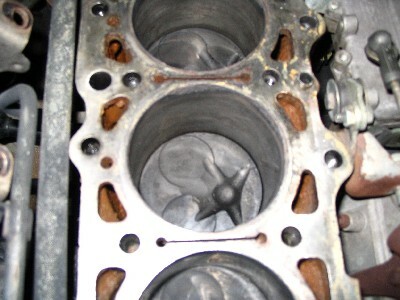 I can't see spending $2k on a new head, if I go that far I might as well kick in another $4k for a re-built long block and ip and just be done with everything. Well, I started my head rebuild job. 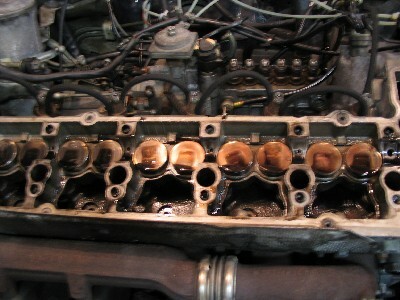 Removed the old head and discovered quite a few cracks on the #4 and #5 cylinder, between the valves and the prechambers. Also, the valves were pretty rusted. Obviously, coolant has been geeting into this area for a long time, even though I immediately stopped driving at the first sign of coolant leakage. I've included some pictures below. If you look close, will will notice some corrosion on the lip of the cylinder sleeve on the #4 and #5. I was wondering if anyone had some experience with this. Its looks like the head gasket was not affected in this area and I am hoping that this corrosion won't affect performance too bad. Before I removed the head the performance was great and no external leaks were visible. I've shipped the head off to Metric Motors for an estimate. They sell new MB heads for $1700. With the costs of labor and new parts here and there, I expect the total repair to be about $3000. Ouch! I am taking this time to also repair items on my list while the engine bay is more accessible. I've replaced the Aux Water Pump, a washer fluid motor, washer hose, and cleaned everything else. 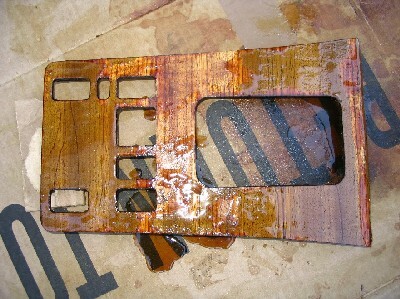 I have also removed the center console wood and began stripping off the old finish to restore it. It was badly cracked. I've included a picture after about 10 coats of stripper. I expect I will need another 10 coats to finish the job. That original finish is tough!! Does anyone know what stain to use for a good match. The rest of my wood is in excellent shape and appears to have a reddish tone. I was thinking that a cherry mixed with walnut might work. Anyway, I will post more pictures as I continue the restoration. As a side note. I read Hatterasguy thread concerning the sale of his SDL. Oh no! He has been my hero ever since I bought mine several months ago. However, I will have spent $4000 in repairs/refurbishment since I bought my 300SDL. I am still committed its its restoration, but I suspect I may go down the same path if things don't get better. Outside of a new transmission, and paint, I've replaced about every critical part. With a new head, new valves, new lifters, new injectors, new glow plugs, and new fuel lines I hope to get some trouble free miles out of it. I am still shooting for a goal of 10 cents per mile. I now need to get 100,000 out of it. Still seems resonable (I think). Hatterasguy - Stick in there!! "He has been my hero ever since I bought mine several months ago." Ok now I'm going to have a big head! Since you already pulled the head how hard does it seem just to get to the lifters? Was the cam a pita to get out? Cam was easy to remove. The hardest part was removing the pins that hold the timing chain rails in. I made a puller out of a 6mm bolt, socket and washers. Worked great. The cam simply unbolted using the specified sequence. Once the cam was out, I removed the lifters by hand. They just pulled out. However, I put it all back together and shipped it out. 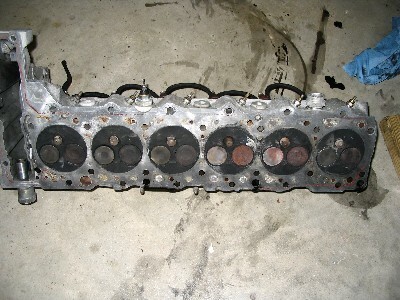 Mike at Metric Motors will pull what he can off the old head a build me up a new head. Until then, the car sits in my garage dripping deisel fuel. I have received the new head and am ready to begin reassembly. Total costs was $3800. This includes new everything in or on the head (injectors, glow pulgs, valves, seals, cam, lifters, prechambers, fuel lines, head bolts, and chain tensioner,). Also includes a new vacuum pump and belt tensioner. I hope to begin reassembly this weekend. 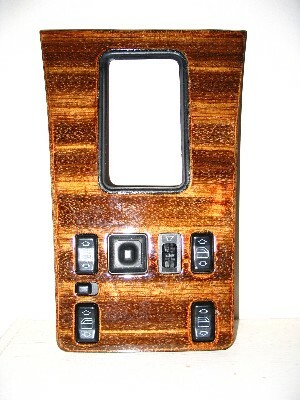 It the meantime I refinished the center console wood and replaced the shifter bushings. The center console didn't come out as well as I hoped. I had a hard time removing the old finish. Got a little aggressive with sand paper and wore through some laminate in places. Stained it anyway and put lots of marine polyurithane on it. Here is a picture. Probably will look for a replacement once my bank account recovers in a few years. I put my engine back together and have driven for for about 50 miles. Boy was it hard to start at first, but now is running great. However, I am noticing water seepage between the head and the block. I fear I did not get the head bolts torqued correctly. I followed the 4 step procedure, but maybe some of my 90 degree turns were more like 80 degrees. I was wondering if it is OK to apply another 10 degrees of turn on the bolts near the seepage location? Last edited by Hal Scripka; 11-24-2004 at 06:50 PM. Thanks. I agree an angle indicator would be nice. I plan on retorquing some of the bolts tomorrow. If it still seeps, I'll just live with it. The engine is purring nicely now and the acceleration is great. I find it unusual that you would have water seepage even if you failed to torque the head precisely. If you didn't do the torqueing yes, but even 60degrees , twice should be enough to stop the leak you describe. 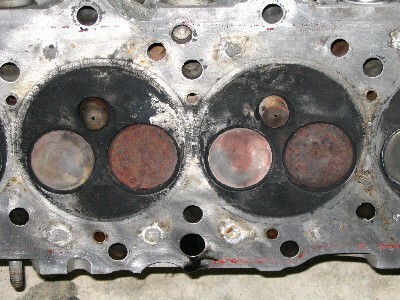 Are you sure that the head, block and gasket were clean? It wouldn't take much to leave some grit there and suffer a leak. I recommend pulling the head again and checking why you have the leak. with serious questions RE: the # 14 head on his engine. This gotta be the record for reviving an old topic! But you have to admit that this is the Achilles heel of an otherwise fantastic vehicle. Just out of curiosity, did everyone who had this problem in this thread have it replaced? What were your end solutions? Still hauling me to school and back.